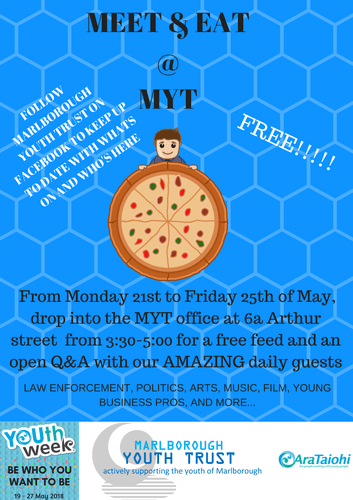 Come in to the MYT office in the afternoons of youth week and grab a free feed. While you're there meet our awesome guests and ask the questions you want to ask. This is a Youth Week Initiative, with the theme 'Be Who you Want to Be'. Our daily guests will range from film makers, to police officers, and even the Mayor is set to pop in for a chat. We will be doing a daily video with our guests for social media to reach those who couldn't make it and give you a chance to text in your burning questions to be included in the film. Timings are from 3:30 - 5:00 daily with an open door policy so drop in and out at your convenience. Follow Marlborough Youth Trust on Facebook to see who's on each day!